Fair Dinkum Sheds introduces a new app that allows prospective buyers to design and customise a steel building structure in 3D on their mobile phone, tablet or computer. The new Shed Designer App is a free application from Fair Dinkum Sheds that offers users the flexibility to create and refine their design ideas for steel sheds or garages. The App offers the user a wide range of capabilities, enabling them to set the dimensions, roof pitch and colours of the shed, as well as add or remove walls, skylights, roller doors, windows, personal access doors, glass doors and steel sliding doors. The app renders the building in 3D, so that the shed can be rotated for viewing from all angles. 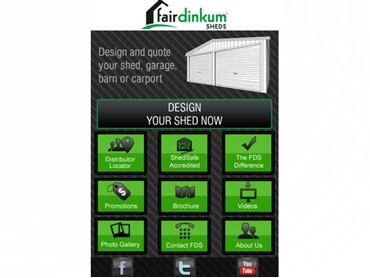 Once the design is finalised, the user can submit it to Fair Dinkum Sheds for quoting by their local distributor. Nathan Caines, Business Manager for Fair Dinkum Sheds describes the Shed Designer App as ‘a real innovation that is especially convenient for people who are time-poor or live in remote or rural areas. Users can spend time at home coming up with alternative designs that meet their specific needs, and submit them to Fair Dinkum for quoting once they are satisfied with the overall appearance and inclusions’. Mr Caines explains that the app meets the needs of people who are short on time but want to engage more in the design process. Though Fair Dinkum Sheds distributors already offer a shed designing service, it’s not always practical for customers to visit distributors in the early stages of the purchase process. Fair Dinkum Sheds can assist from concept to completion on any requirement for garages, carports, farm sheds or commercial buildings. Their steel buildings are robust, economical and individually designed by their professional expert team, and are available in a large range of options including single roller doors to large double roller doors, remote control operators, windows, glass sliding doors, insulation, whirly birds, personal access doors, skylights and more. Steel buildings are also available with a gable roof or a skillion roof if required. Fair Dinkum Sheds is a ShedSafe Accredited company and operates a wide network of 150 distributors located across Australia.